Plan A, B, C, …..
Today was gorgeous day in Maysville, OK. We have really been blessed with wonderful weather. We spent a good deal of time this morning working on getting our master plan on paper so we would lay out the downstairs. 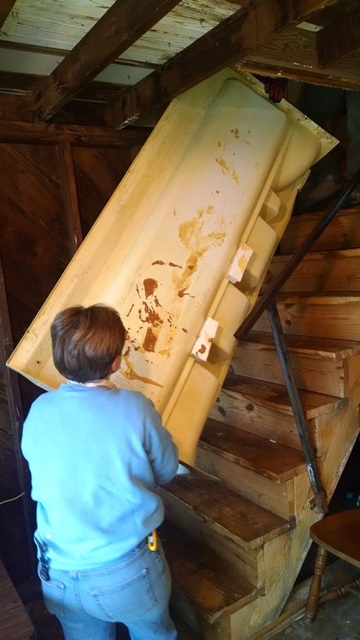 We really wanted to make the steps to the second level safer for the home owner. Currently they are too steep and have minimal to no hand rails depending on the section of steps. He told us he has fallen down the steps 3 times. All we can say is he is a very fortunate man to not have had serious injury. 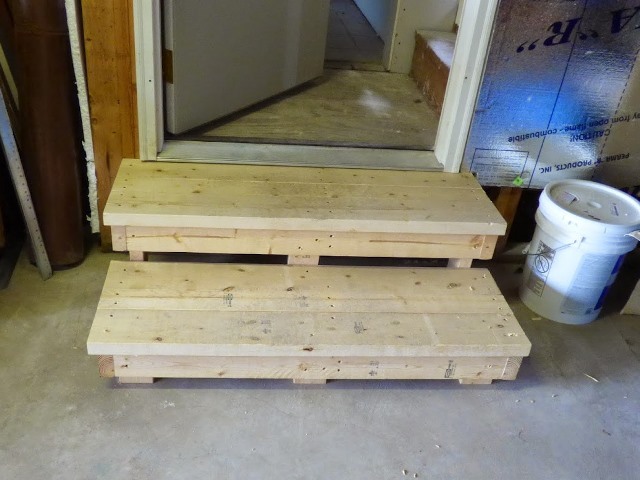 After a great deal of study, we gave up on trying to make the current steps safe and determined we will tear out the current steps in order to install steps with the appropriate tread and risers. 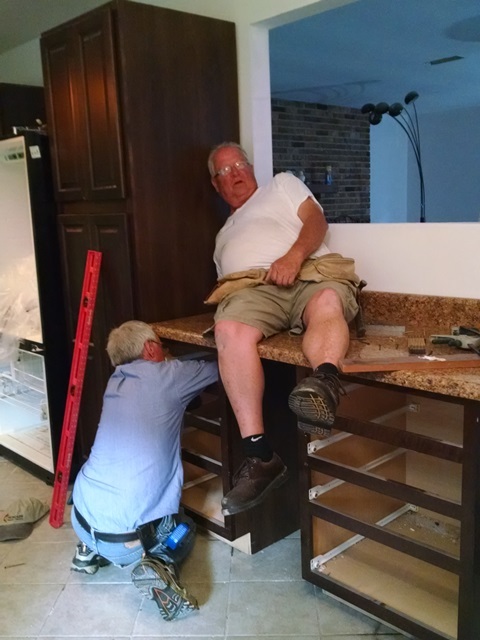 We also drew up a plan to move the bathroom down stairs, install an efficiency kitchen and living area. 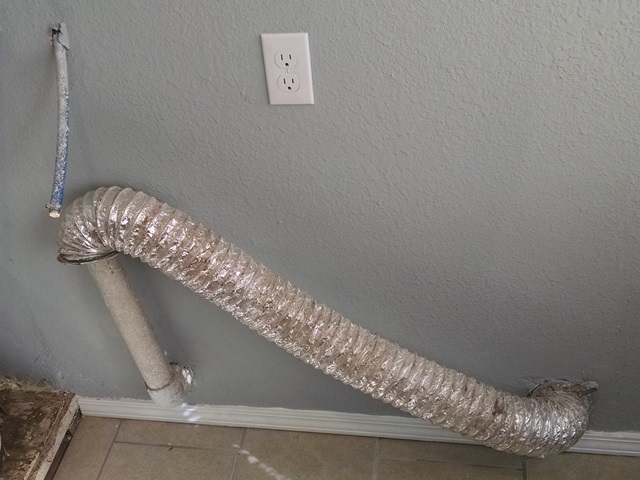 This plan is about Plan C.
The real work began when we started removing the old plumbing and had to remove the main drain pipe. NASTY!! Actually we were pretty neat with it – all things considered. 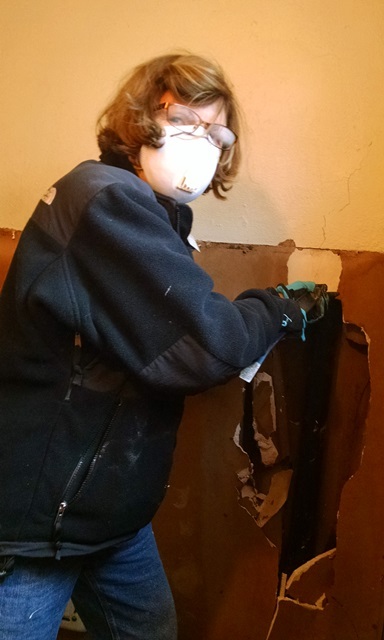 After all the plumbing was removed, the demolition divas/darling destroyers completed the demolition of the upstairs bath removing all the rotten flooring down to the floor joist. 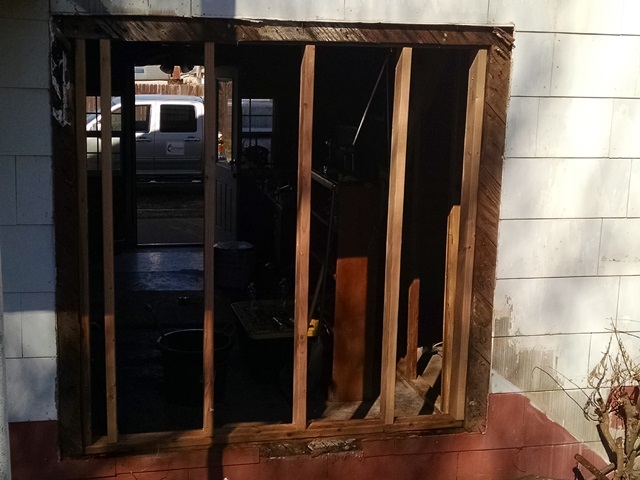 The team also removed old windows on the back wall of the first level, and framed up the opening. 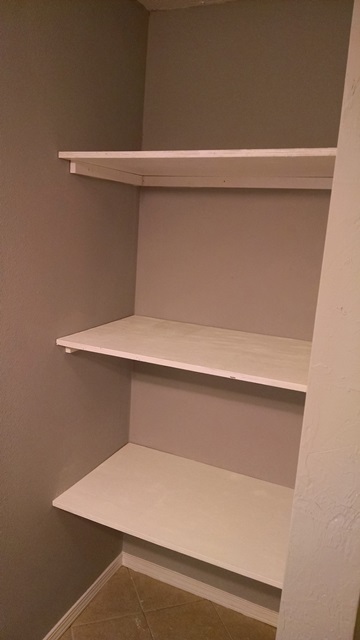 The alcove for the refrigerator was framed and some of the exterior walls were insulated. 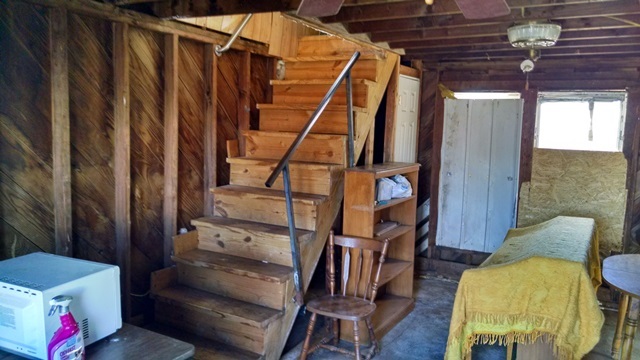 The home owner was not available today to discuss the floor plan and arrived just as we were leaving. Our team leader discussed it with him briefly and the home owner requested a copy of our drawing. We really were not sure he was pleased with our plans so Gary went back this evening discussed it all with him in detail and left him the floor plan and a red pen to use to mark up the things he doesn’t like. So come back tomorrow. We may be drawing plan D, or returning to plan A or B. It’s all good. We want our sweet home owner to have safe steps and be happy. Anything else is a bonus. By the way, click on the pictures to see them full size and remember we love comments. Author rvingwithapurposePosted on February 21, 2017 Leave a comment on Plan A, B, C, …..
Today Gwen did our devotion and introduced us to Wisdom Hunters, a daily devotion by Boyd Bailey of Atlanta. She often uses this devotion for her morning quiet time. She and Gary know Mr. Bailey. The one she used today is called “Love is Slow to Anger” and was very good. Check it out. After devotion it was off to work. 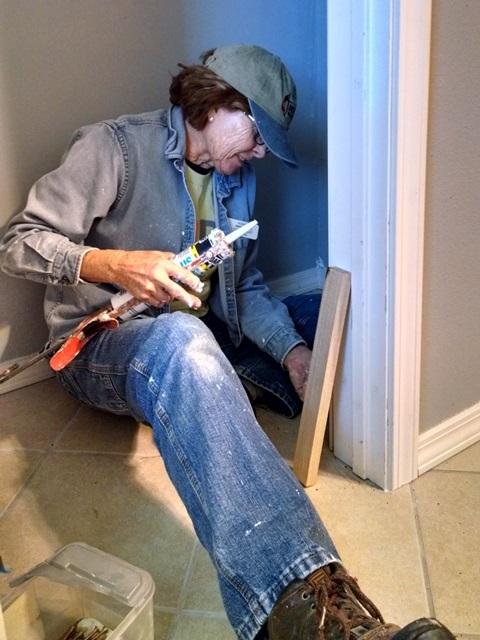 Today we started on a very nice 81 year old man’s home. He is such a sweet man who let his children, and then his grandchildren, move into his house next door while he moved into this converted (and unfinished) garage. He is staying in a camper trailer next door while we work on the house and he would go to the trailer and then in a little while he would be back to see what we were doing. Shortly he would go back to the trailer, but then you would look around and he would be walking back down the street toward the house. He is really excited that we are here. The guys today worked on the main entrance that formerly was a garage door and had been framed in with 2 windows and a walk thru door. 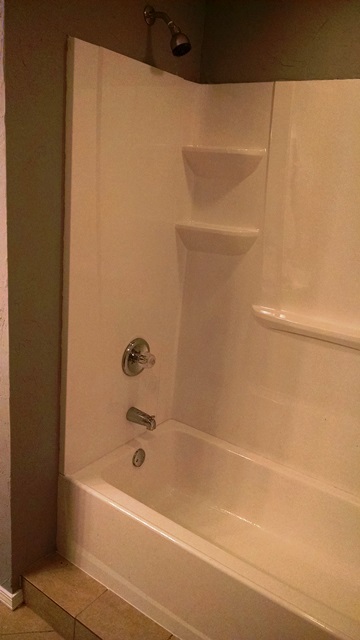 They aren’t quite through yet and it will need caulking and painting, but looks better already. 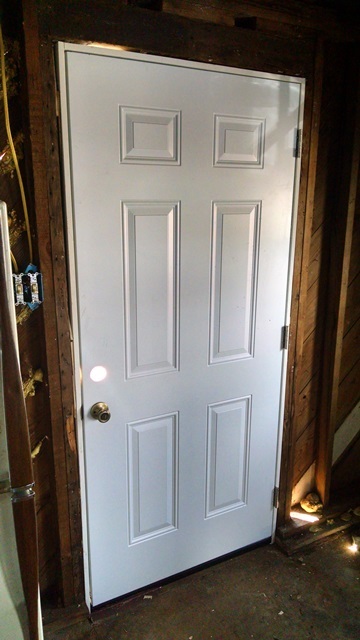 They also installed another door that leads to the back yard. With those two things done the home is already much more secure. The ladies really rocked today. 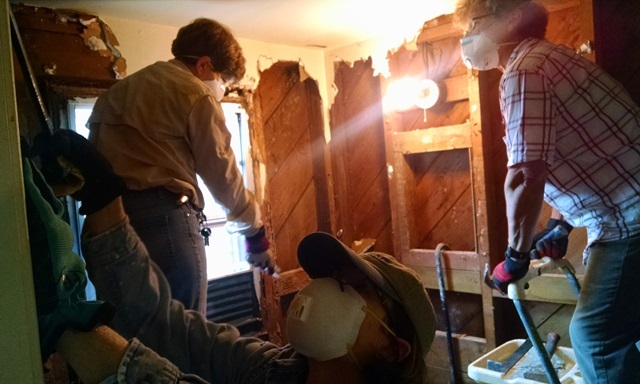 They had fun demolishing a bathroom. 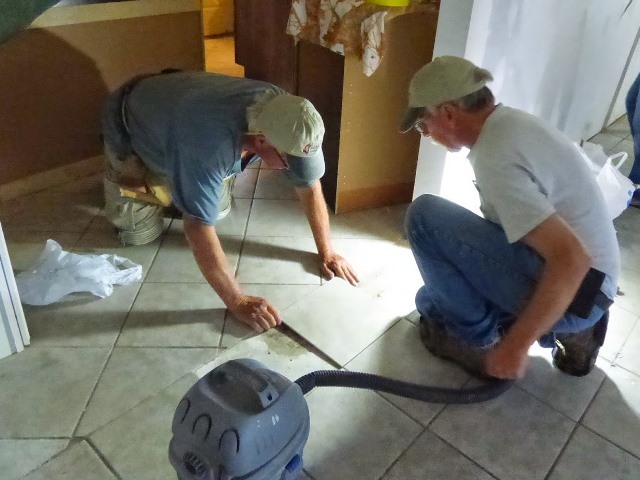 Everything had been leaking and the floor is rotten. 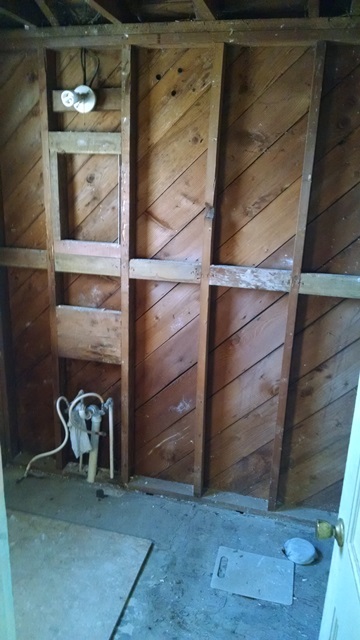 The ladies first removed the shower, commode, and sink/vanity and then removed the old drywall from the walls and ceiling. The only thing left to in there before starting to rebuild is to remove part of the floor. 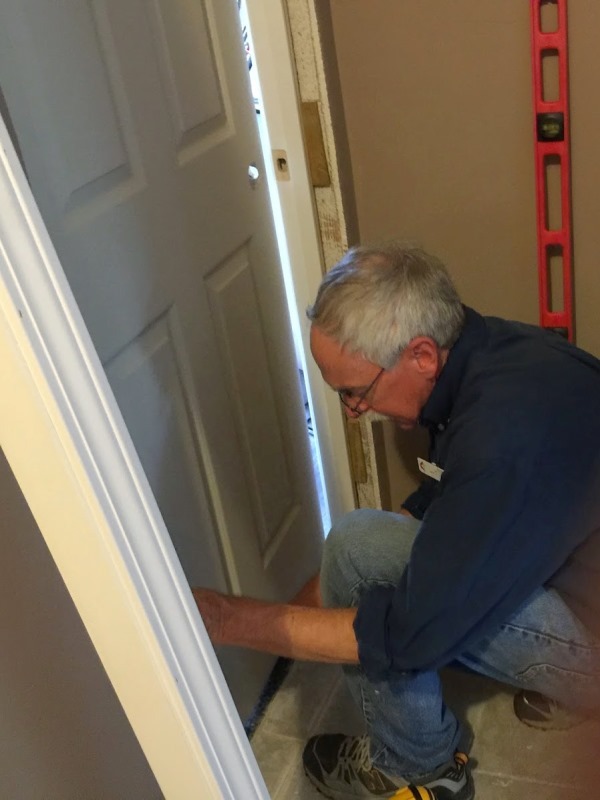 It was a very productive day for everyone and the home owner was very pleased with our progress. Hope you had a great start to your week. Stay safe! Hope everyone had a wonderful Sunday. We again enjoyed worshiping at First UMC of Elmore City. We went to Sunday School first and spent a good deal of class time sharing with the class the ins and outs of what NOMADS do. Most of them had never heard of NOMADS before we came here – not a surprise. After hearing our story, the Peacemakers quilting group wants to give us some quilts or prayer blankets for the auction at annual meeting to help raise money for projects. That would be really nice!! The class was using a devotional book written by the pastor’s husband for their class study book and we really enjoyed the reading and discussion. 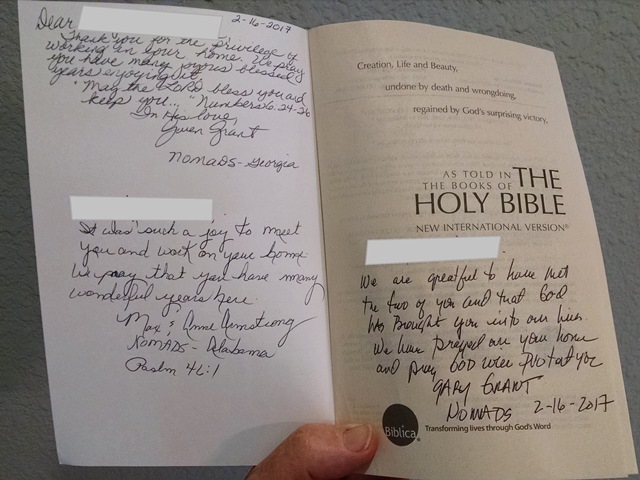 Later, Mike Lovett, the pastor’s husband, actually gave each NOMADS couple a copy of the book, The Country Road Through the Book of Matthew. The section we reviewed in SS today was quite good. You might want to download a sample. After worship we had a ”pot luck” dinner in the fellowship hall. Isn’t it interesting how in different parts of the country we use different words for the same thing – pot luck, pitch-in, covered dish – all the same thing – and no matter what you call it, it’s always a great meal. The people in Elmore City didn’t disappoint. We won’t need any more food today! In the end it was decided they could have the prom with dancing, but with stiff supervision. The students could not come and go and they “corralled ‘em up and didn’t let ‘em out til the next morning after breakfast.” The event put Elmore City on the map with reporters from San Francisco, New York and People Magazine all in town to report on the prom. The media coverage caught the attention of the screenwriter and the movie “Footloose” was based on the events. The locals were all also quick to tell us that some of the stories and the movie were not so accurate portrayals of their sweet little town. Some didn’t want to even talk about it – seemingly embarrassed by it all. 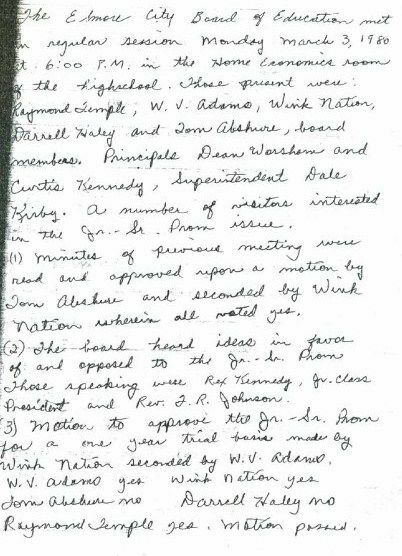 We found this story in the archives of People with some of the perhaps not so factual information. There was also a recreation of the 1980 prom on the 30th anniversary. We found several other articles that (if you are REALLY interested) you can find with a simple Internet search. 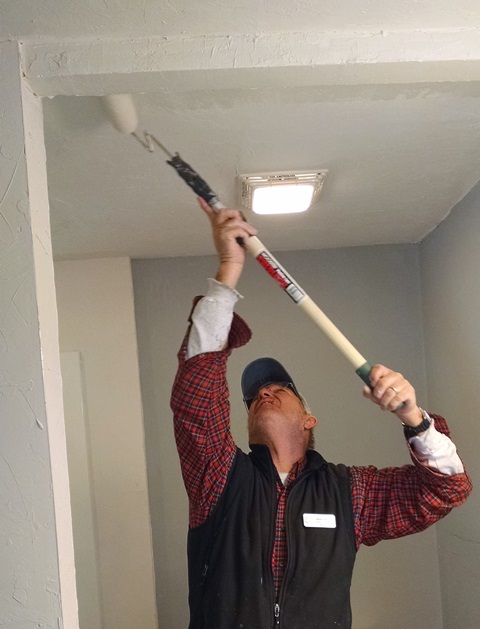 We worked the first 2 weeks of the Gulf Breeze Disaster Rebuild Project, November 3-14, 2014. We had a great team that really came together well. We knew no one when we arrived, but by the end of the second week we really, really didn’t want to leave. Just loved those folks. Gulf Breeze flooded in the spring of 2014. It rained over 26 inches in less than 24 hours and there was wide spread flooding. The house we worked on had been mucked out and partially rebuilt. 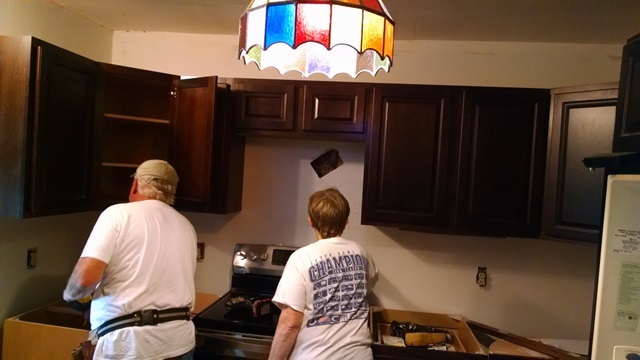 The homeowner had used all their FEMA money and had no choice but to move back in the house with the kitchen inoperable, no appliances or cabinets, and no interior doors. 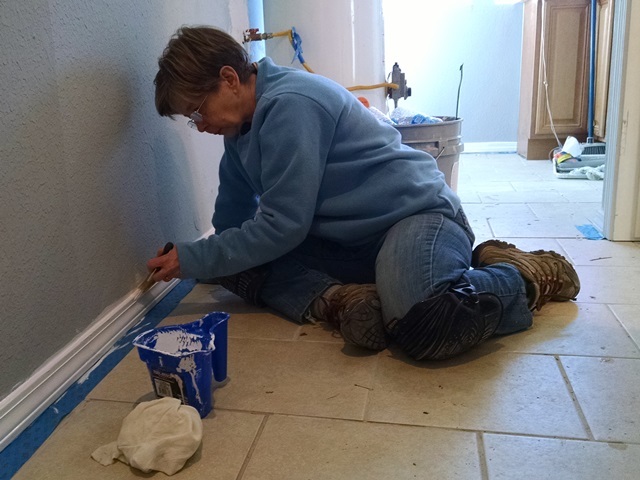 The drywall was up but still needed some taping and mudding and lots of sanding to be done and then all the painting. 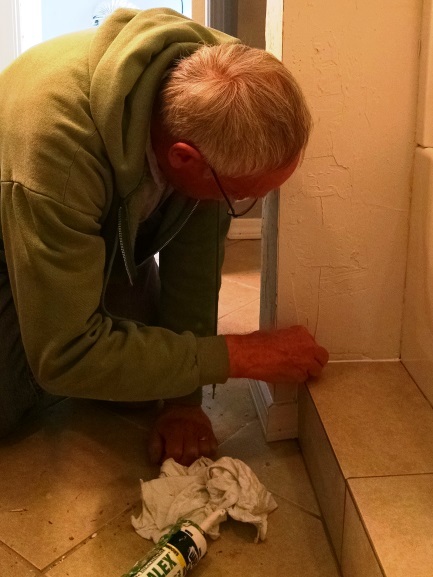 Most of the tile work was done. A precious family of four – a grandmother, her daughter and 2 granddaughters were living in the unfinished home. 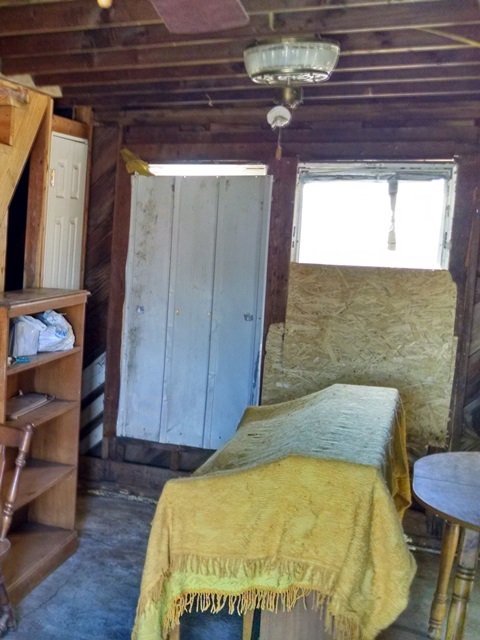 They had a little dorm size refrigerator, and a microwave and some air mattresses on the floor and that’s how they were living. 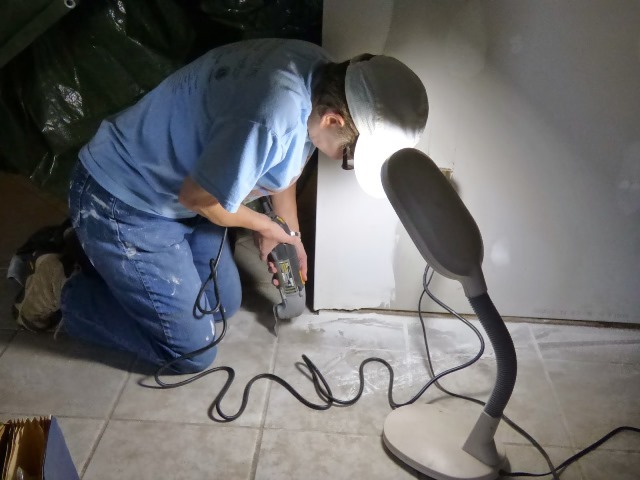 The daughter and her boyfriend worked on the house at night and on the weekends, but they were just overwhelmed and exhausted by the time we arrived. They told us that their puppy woke them up during the night of the flooding. Water was up about mid-calf. 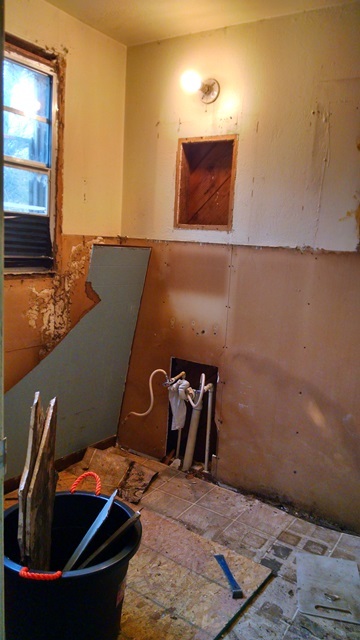 They used a kitchen knife to cut through drywall to get upstairs to a bonus room and safely away from the rising water. They were rescued by boat. So, we finished up the home for the beautiful family that lived there and presented them with a Bible signed by the team. It was a lot of really hard work but very, very rewarding. While in Gulf Breeze we also had lots of fun. 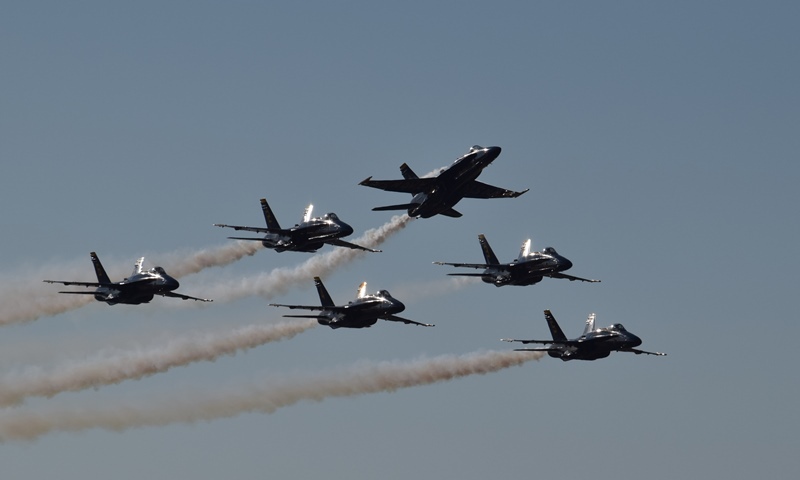 The Blue Angels were performing their last show of the season so we got to watch their practices right from our campsites and then we all went to the final performance on Sunday afternoon. We also ate really good. 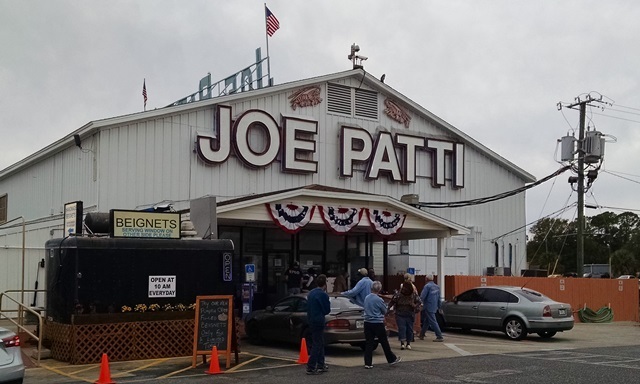 We found the largest and best seafood market – Joe Patti- we have ever visited. On one of team member’s suggestion, we bought some of the Royal Red shrimp. 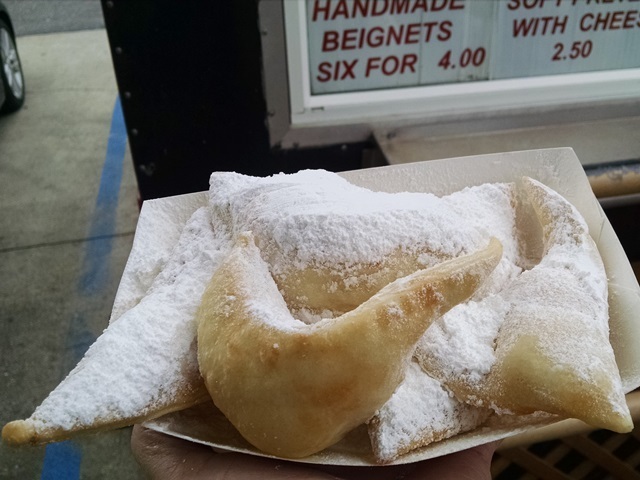 And of course we also had an order of the beignets from the food truck right outside the market. The Royal Reds were phenomenal. 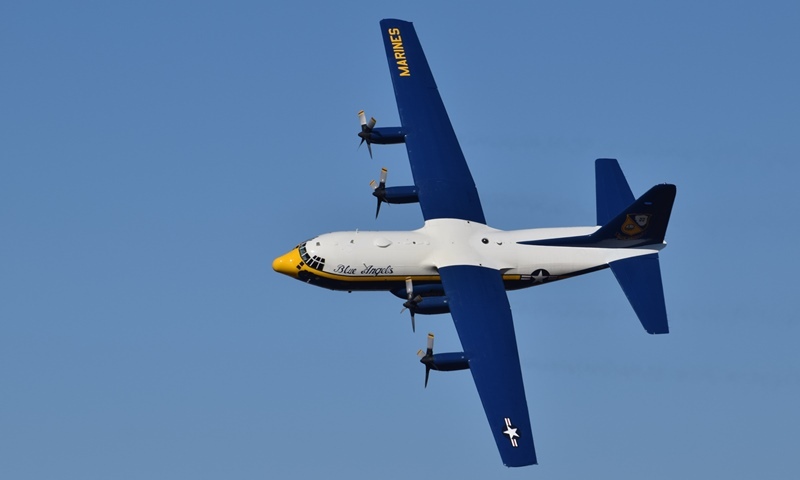 Overall – it was a great two weeks – such a blessing to be able to participate –and we highly recommend others find a way to participate in similar mission work. You will be so blessed. Tomorrow we will have church and covered dish dinner. NOMADS really enjoy eating and maybe we will find out more about Elmore City and Footloose. This is the first Saturday of the NOMADS week so we slept in a little, had breakfast and then drove north about an hour to Norman, OK. Gwen and Gary went with us. Our target was the University of Oklahoma (OU) campus, but before we went there we stopped at Jason’s Deli for lunch. 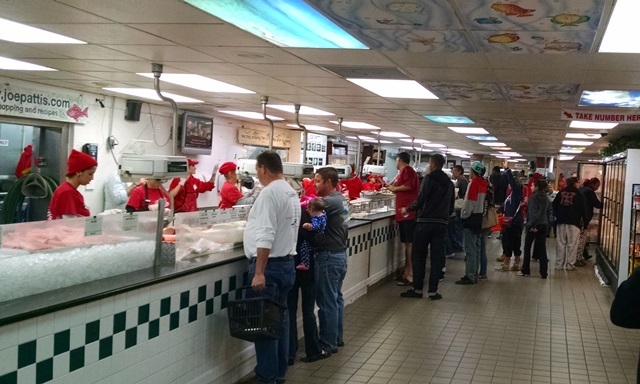 We all enjoyed our food, especially the free ice cream. After lunch it was on to OU for our 1:00 tour of the National Weather Center. The tours are Monday, Wednesday and Friday, but they do not allow walk-ins. You must preregister online. 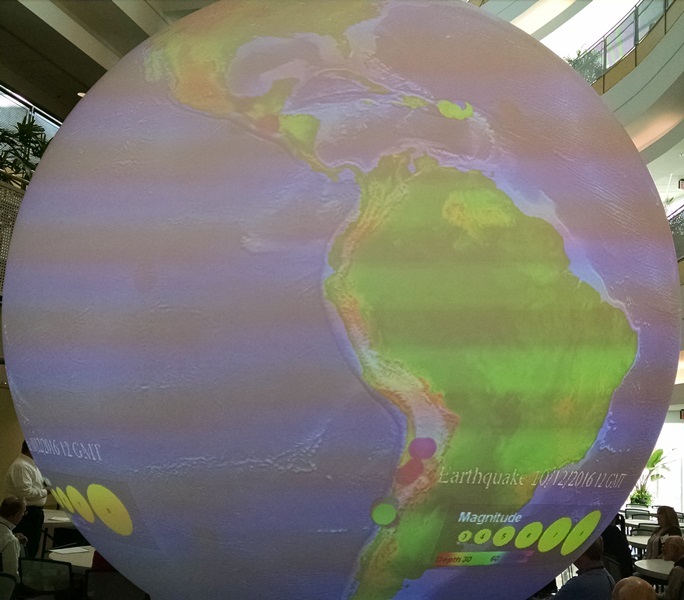 The National Weather Center is a 250,000 sqft, 5 story building housing the OU meteorology school, as well as the center for climatology, the National Weather Service (NWS) Storm Prediction Center, the NWS Norman Forecast Office and other university and government offices. There was a short video before the tour began and then an OU student lead our tour. We had a large group which included several high school seniors who were considering attending OU. The first stop on the tour was the observation deck on the top floor. There is an outside deck as well as an inside/glass walled area ideal for watching storms approach. From the observation area you can see a long way. With no hills/mountains to block your view it would be a great place for watching storms and tornadoes move in. There is all sorts of equipment on the roof gathering information to assist in forecasting and research. 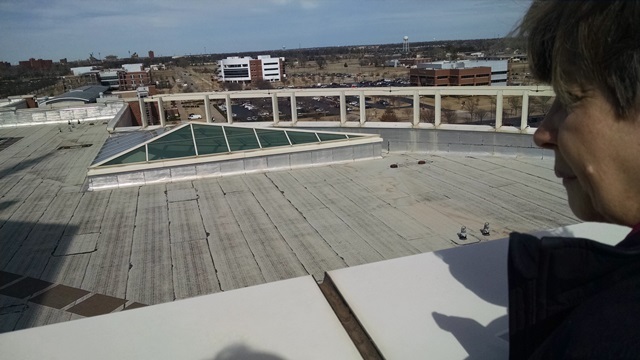 From there we moved to the 5th floor which houses the OU School of Meteorology. There are all the necessary offices, research areas and labs to support the school. 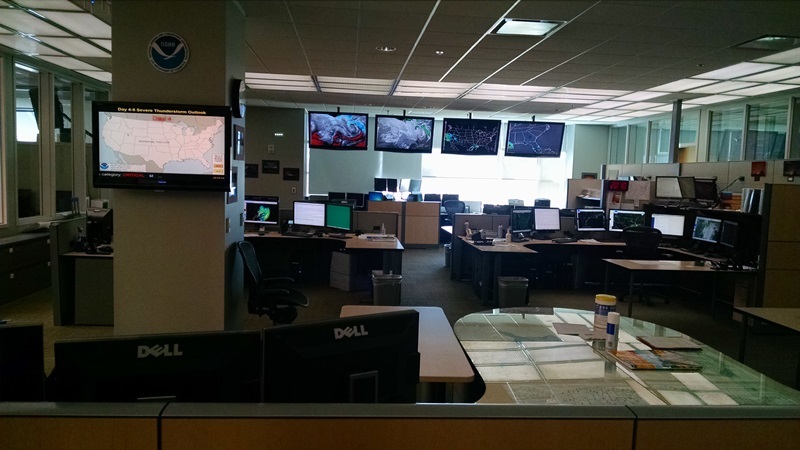 On to the 2nd floor, and we visited the Storm Prediction Center and the local weather office. All severe thunder storm watches and tornado watches for the lower 48 states are issued by the Storm Prediction Center as large polygons. Once the polygons are drawn, the local forecast offices determine which counties in their forecast areas are included in the watch. 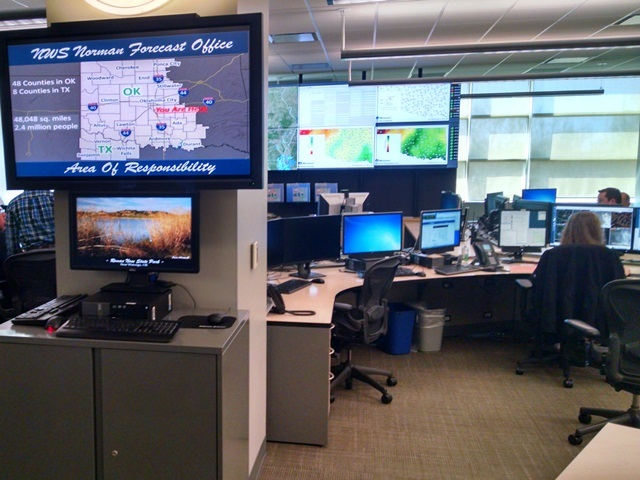 There are at least 4 people on duty in the SPC at all times to follow the weather systems moving across the US. Doesn’t really seem like enough people to cover the entire country. 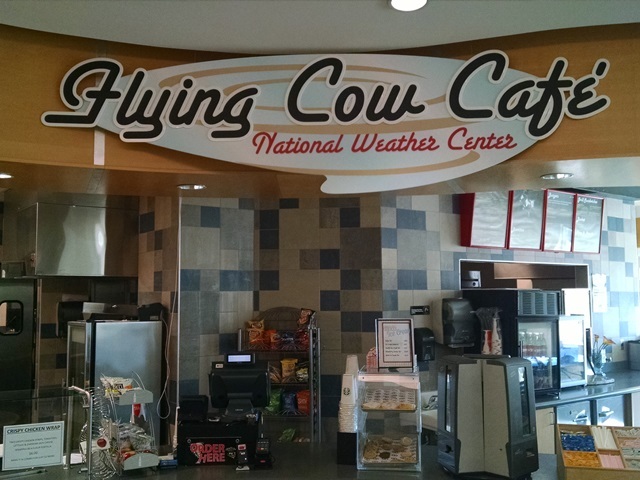 The tour ended at the Flying Cow Cafe – a reference to the cows in the movie “Twister”. 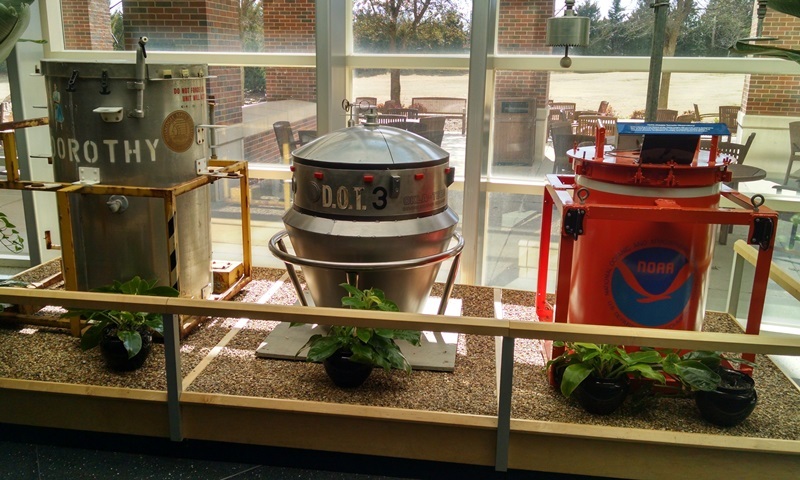 In the lobby just outside the cafe is a display of three weather sensor pods – two fake ones that were used as props in the movie “Twister” and a real one use by the NWS to try to capture readings inside a tornado. 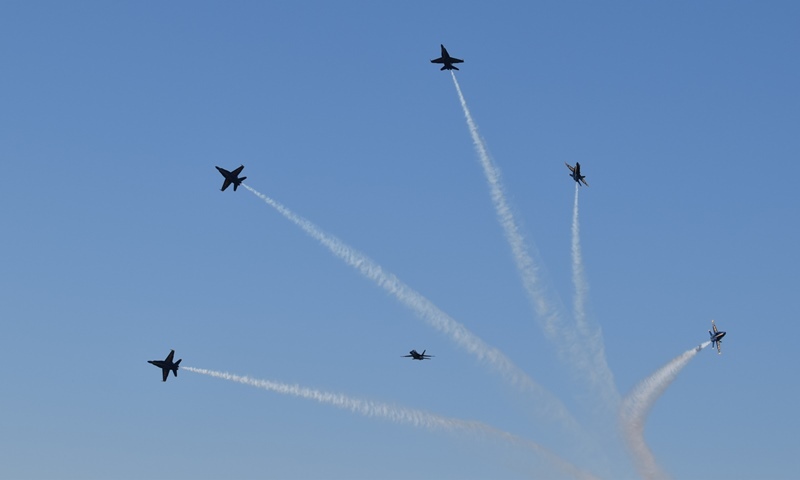 Dorothy (left) and D. O. T. (center) are the props. Toto (right) is real. The tour was interesting, but somewhat disappointing. We had hoped for more time spent touring the NWS offices, but most of the tour seemed to be a recruiting effort for the OU meteorology school. After leaving the weather center, we made a stop at Sprouts Grocery store. They had some really good looking fruits and veggies at nice prices today. We loaded up on fruits and veggies since our grocery stores are limited in Elmore City and Maysville. We will have some good food in our lunches next week..
Hope everyone has a great weekend because we are! Today was another beautiful sunny day. 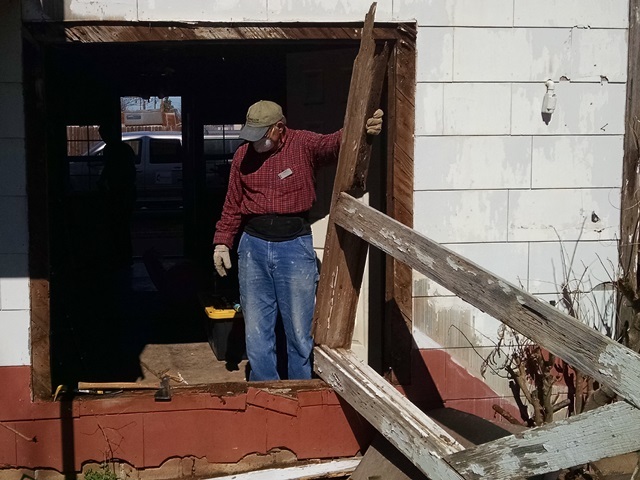 So we have finished our first week on the 2017 Oklahoma Disaster Rebuild Project. It’s been a great week. Today we completed our first assignment. 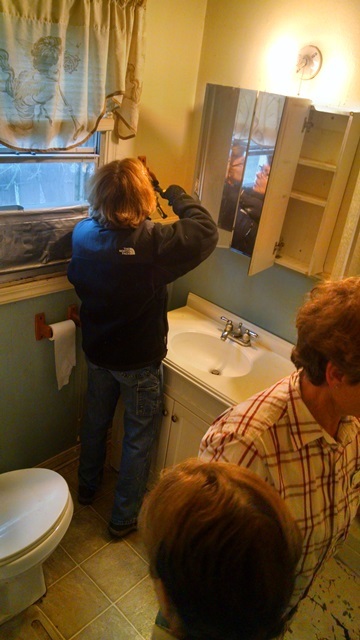 It was a one bedroom, one bath home in the middle of the area that flooded in Maysville. 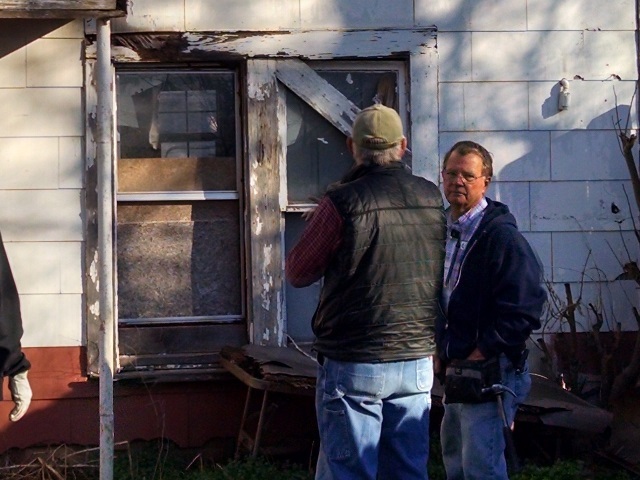 The rebuild began several months ago – “before Halloween” per the home owner. The application process began even before that. The home owner said he had decided that his home was a total loss and he would just get it bulldozed and sell the lot since he didn’t have any insurance and not enough money to do anything else. 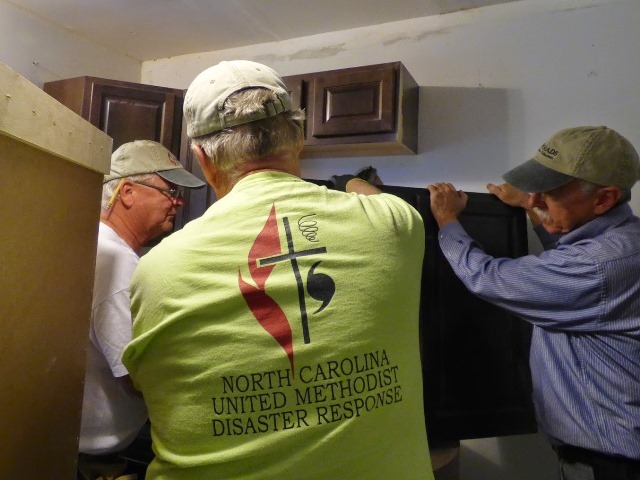 Someone from United Methodist Disaster Response-Oklahoma came by to see him. He told them they could take a look but…. When he was told they could help him he wanted to know what was the catch. “From my experience ain’t nothing free so what’s the catch.” First a VIM team came in and mucked the house out. 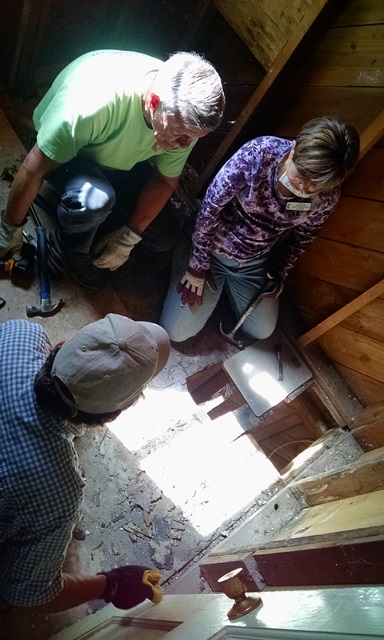 A team from Colorado came in and started the rebuild working on the interior and exterior. 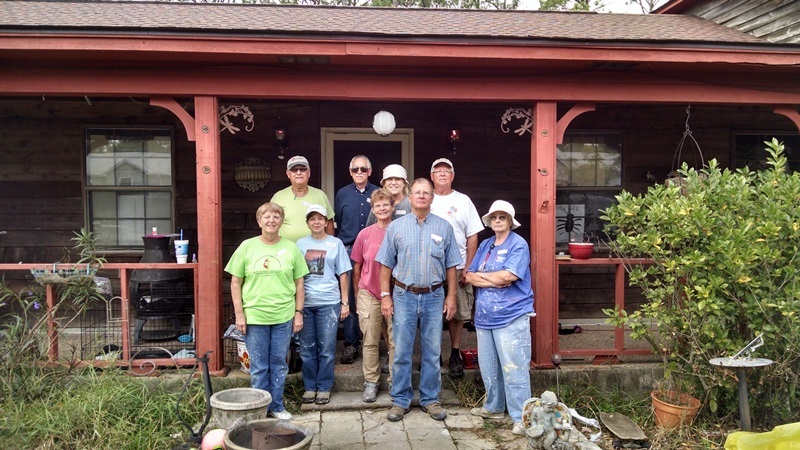 Several more VIM teams from Oklahoma and Louisiana worked on the house. Finally this week, we had the joy of completing the final work. 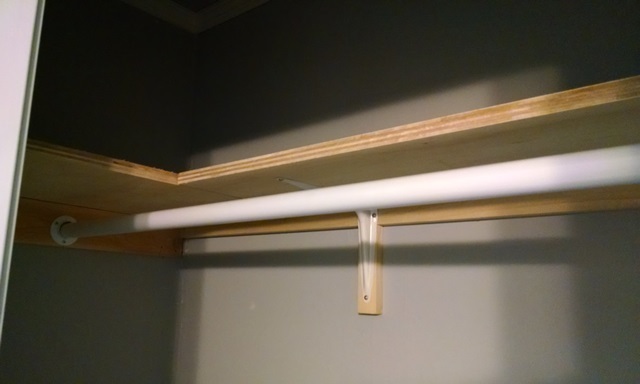 Today we finished the painting, installed shelves in the closets, installed bathroom fixtures and generally cleaned up the construction mess. 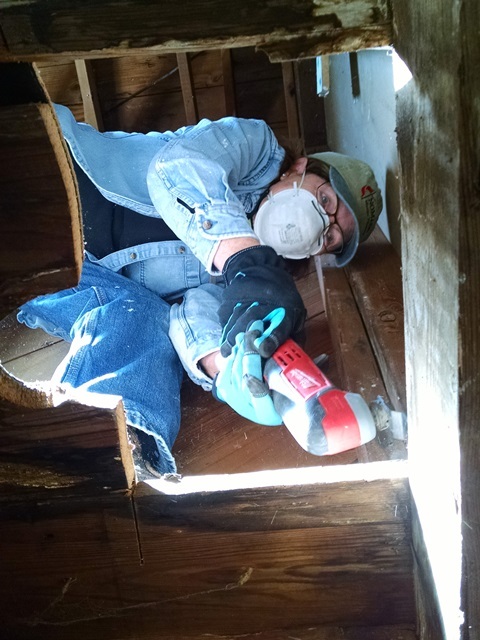 It is the tradition of NOMADS that everyone who works on a rebuild writes a note to the homeowner including one of our favorite scriptures, in a Bible that we then present to the homeowner. This afternoon we presented the Bible to the homeowners of “house #1.” It was so great. The homeowners were so happy and yes tears were shed. A few months ago they were hopeless. 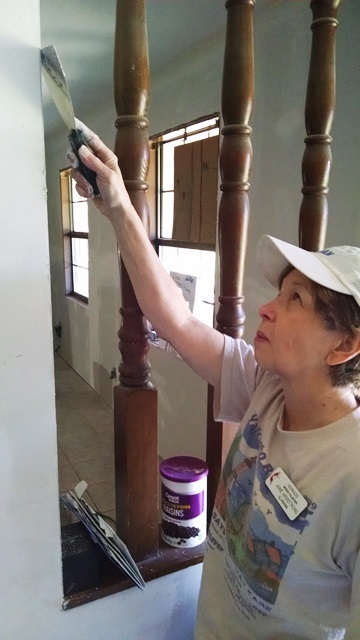 Today, with the help of people who love God, they are back in a home that is better than before the flood. What was the catch? Only that he and his wife have been surrounded by the love of God for the past several months. They were truly amazed. 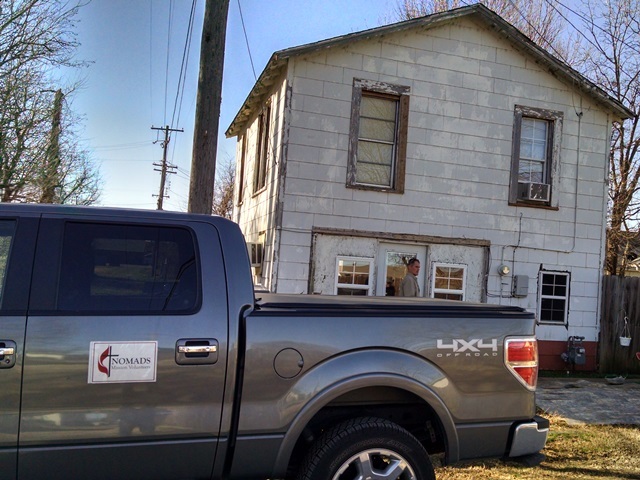 Today some of us also visited the next home we will begin working on Monday. This one has been mucked out but the rebuild has not begun. We have LOTS to do and it will NOT be completed in a week. After work we drove over to the Elmore City Recreation Area. It is a nice area with baseball and softball fields plus a nice lake with about 4 piers for fishing and a boat ramp. Scout would have loved this place. You can walk all around the lake and there is a nice picnic area. There is also what appeared to us as a fill site for water trucks/fire trucks. Didn’t see any trucks come in but…that’s what it looked like to us. We had a question about our devotions from one of our readers and asked that we consider sharing a little more about that time. We will try to do that as we go forward. 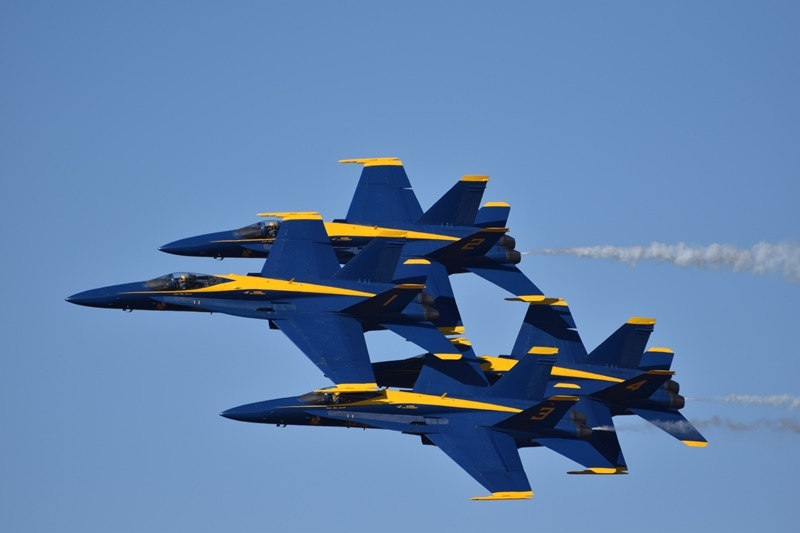 As general information, everyone on the team picks the day they want to bring the devotion. We usually start out by singing “This is the Day” and maybe a prayer. Then there is whatever the person of the day wants to bring – a devotion from their favorite devotion book or some sort of meditation. We have a little discussion as appropriate. We keep a prayer list that we review/add to each day, and have prayer. We sometimes sing another song. The primary thought for today was that we are all called to be seekers. To be a true follower of Jesus means we must become an all-out seeker of Him. Yes, we know him, but there is so much more of Him to know. Proverbs 2:1-6, Jeremiah 2:13. The devotion was taken partially from Seedbed Daily Text. Tomorrow we plan to go to the National Weather Center and Storm Prediction Center in Norman, OK. We have a tour scheduled for 1:00. Should be a fun day. Well, we have no snow pictures for you today. 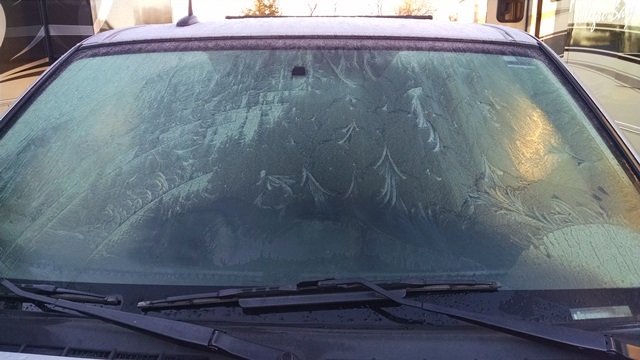 However, much to our surprise the truck was coated in ice when we got up this morning. It was cold, but the sun came out and it was a bright and sunny day. After devotions we headed back to Maysville. It was a much prettier drive today. After a few cloudy days we really enjoyed the sun today. We learned something new about our home for two more weeks. You may remember the picture we used earlier that said “Elmore City, Home of Footloose.” We didn’t know then that the movie “Footloose” and subsequent musical were “loosely based on events that took place in the small, rural, and religious community of Elmore City”. They have a Footloose Festival each year – this year will be April 22. Interesting little town. We will have to ask some of the locals more about this. We would like to hear more about what really happened here versus what was portrayed in the movie. Maybe we can ask some of the older members of the church when we have covered dish dinner Sunday. We will let you know what we find out. We are responsible for devotional again in the morning so must go work on that. We have what we think are some good plans for Friday so check back.